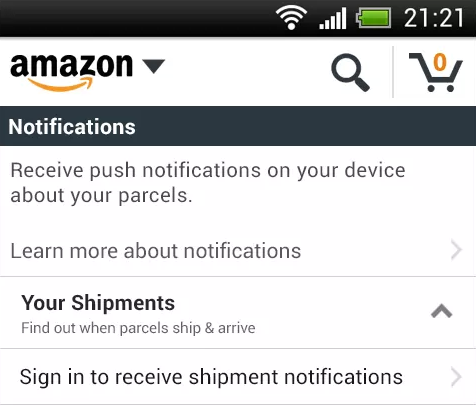 Amazon’s most recent update to its Android app, which came just yesterday, has added the ability for UK users to receive push notifications informing you that the torturous wait for your shiny new whateveryouordered is nearly over. The shipment notification’s feature, which was first opened up for Android users in the US last year, will work on any Android phone running version 2.2 of the software, or newer. Meanwhile, the company also updated its Android tablet Amazon app to include the new functionality for users in the US and UK. It seems that while people in the US could get shipment notifications from their smartphone, the tablet app wasn’t quite at the same point, until now. Both updates also brought bug fixes for minor issues, too. While a small feature, it’s particularly handy not to have to keep manually checking on the progress of your orders when waiting for deliveries.